Convert video/audio file to MPEG1, MPEG2, VCD, SVCD, DVD, Custom MPEG File. Convert video/audio file to WMV/ASF/AVI. Output separate audio and video file for DVD authoring. Audio Sample rate can be specified. Convert video/audio file to MPEG1, MPEG2, VCD, SVCD, DVD, Custom MPEG File. Convert video/audio file to WMV/ASF/AVI. 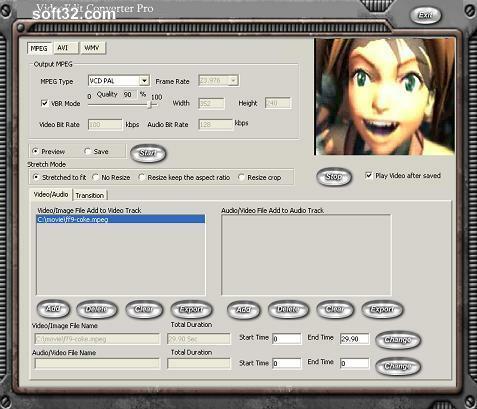 Output separate audio and video file for DVD authoring. Audio Sample rate can be specified. Provide Video Quality configuration in MPEG file. Provide Custom WMV Profile setting, you can define VBR, CBR mode, width, height, buffer window, video/audio bit rate.